Continuing from the success of Groundworks: Algebraic Thinking and Groundworks: Reasoning about Measurement, we offer you Groundworks: Reasoning with Numbers. 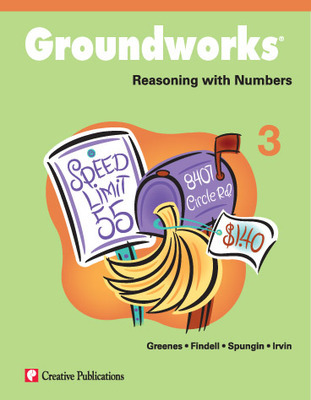 This addition to the Groundworks series provides students with a better awareness and understanding of how numbers and operations are related. Our easy-to-use teacher resource book with reproducible student pages contains challenging problems based on five big ideas of number and operations. Groundworks: Reasoning with Numbers consists of seven teacher resource books with blackline masters, one each for grades one through seven. The series is designed to expose students to problems and activities that will deepen their understanding of numbers, the different ways numbers are used to represent quantities, and the relationships between these representations. Each 128-page book is divided into topics or big ideas, with several sections per topic. Each topic is a major area in the development of Reasoning with Numbers, and each section within the topic relates to and helps develop that particular area. Each section also includes teacher pages and reproducible pages for students.